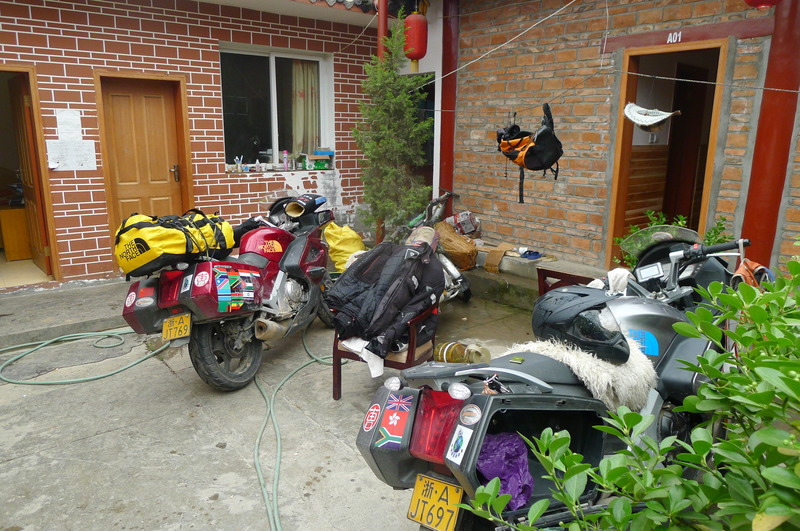 As hard as one tries, it would be impossible to ride around the world on a motorcycle and completely avoid any bad weather. We had heavy rain in the Basque Country and its border with France, and later in England and Wales where it pretty much rained throughout the whole of the summer. 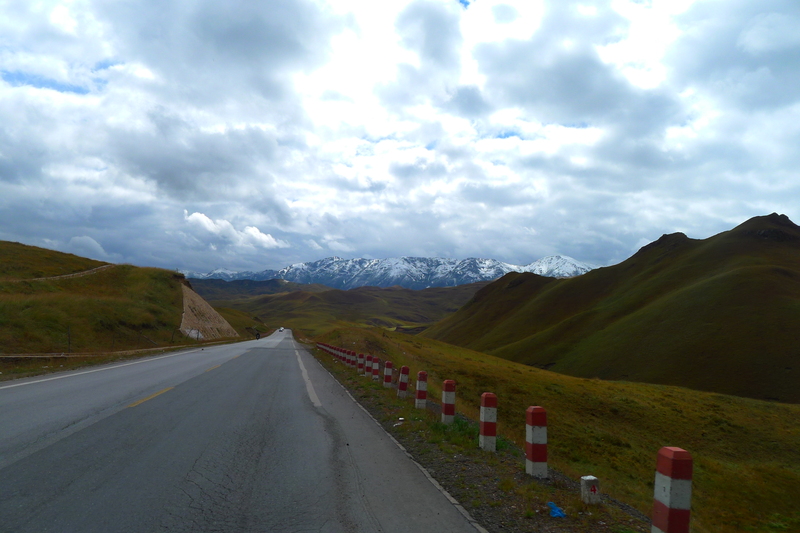 In China we had been lucky so far and enjoyed the best of the autumn weather, but now winter was well truly and on the way, at least high up on the Tibetan Plateau, and so we had to endure a few miserable days of grey skies, snow in the mountains, and blinding rain in the valleys. 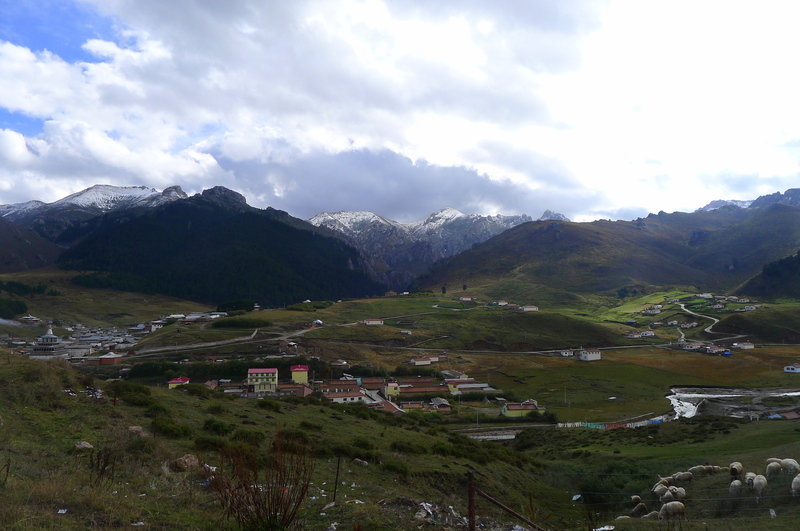 Like Wales, the scenery in Sichuan (四川）does make up for the rain somewhat, and between Langmusi（郎木寺）and Chengdu （成都）near the town of Songpan（松潘）we rode through some very impressive high altitude grasslands that stretched as far as the eye could see. 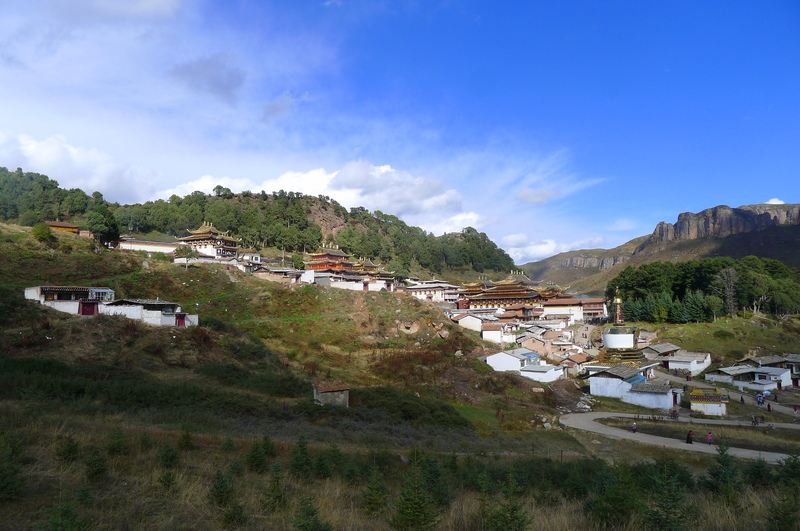 This area is home to very hardy Tibetan herdsmen who tend to their livestock high up on the plateau on sturdy ponies, which also double up to take tourists on pony treks. 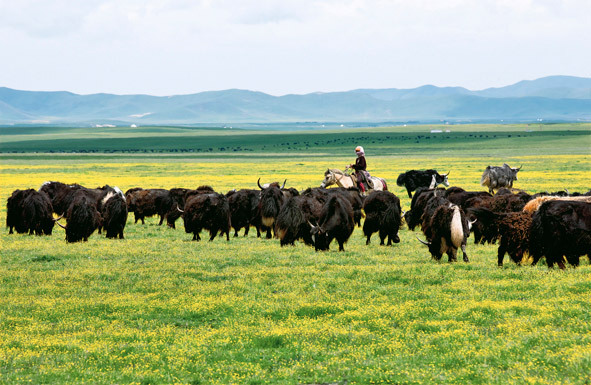 Tibetan herdsmen on the high grasslands near Songpan, Sichuan. 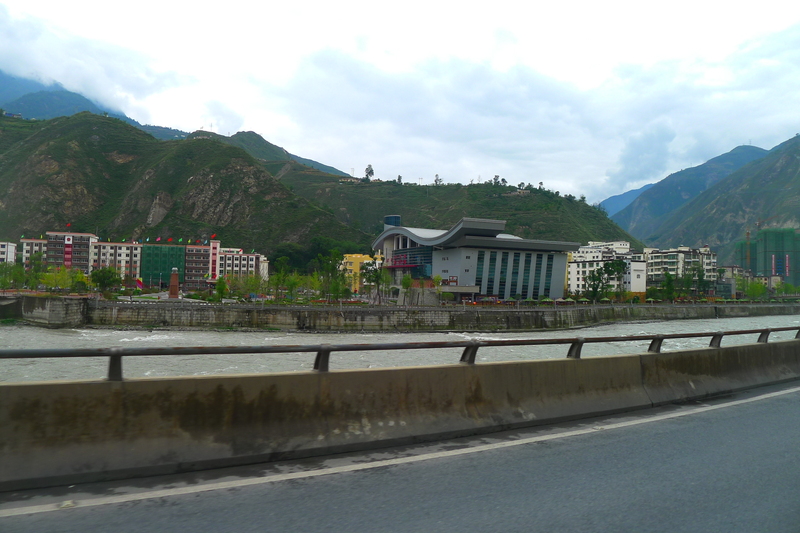 Further south towards Chengdu is Wenchuan County (汶川), the epicenter of the 2008 earthquake. 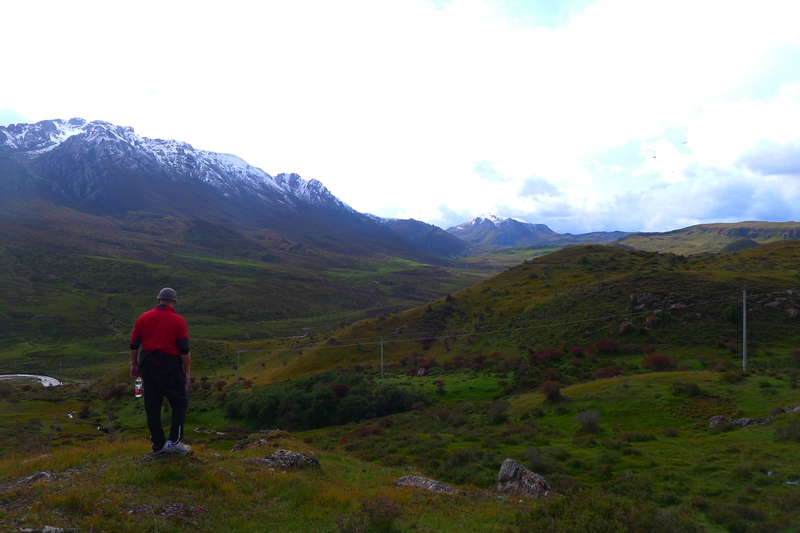 Like everyone else, I suppose, we had a morbid fascination to look at the carnage that mother nature can unleash and explore the surrounding mountains and lakes. 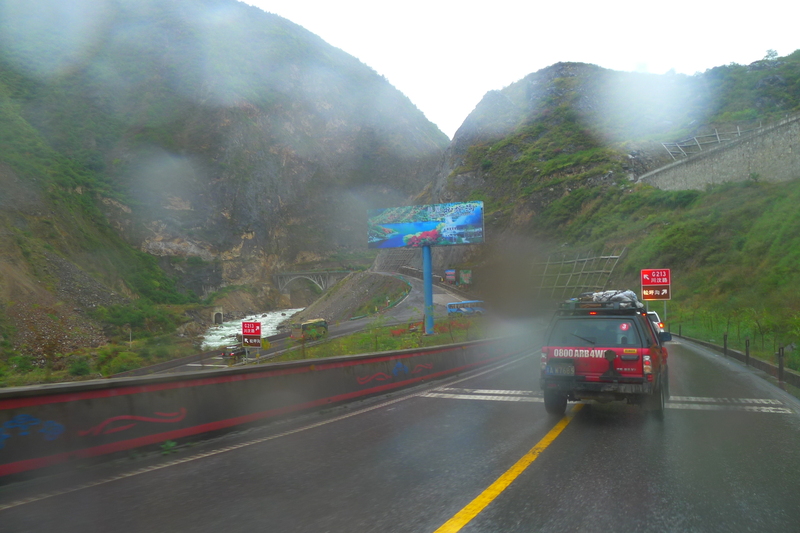 However, as the weather and the traffic conditions had become increasingly bad we both just wanted to get out of our damp and soggy clothes and get to Chengdu as soon as possible. The CF Moto bikes were going very well, nothing seemed to faze them and they just purred along eating up the miles on whatever roads and surfaces they were presented them with. 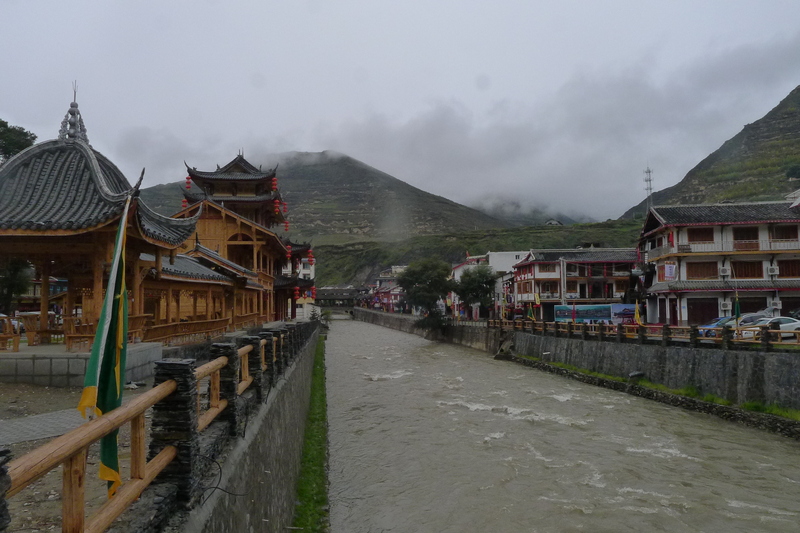 The sheepie that I had bought in Yunnan to cushion my bottom, however, was no longer fluffy white, but rather a bedraggled shade of increasingly darker grey. At the beginning it smelt like sheepskins generally do, but a little later on in the trip had the delicate whiff of wet Labrador lying in front of the fireplace. More recently, I have to admit, the smell was more like wet Labrador that had died… quite some time ago. But it was still comfortable and a considerable improvement over the standard pile inducing seat fitted as standard and when traveling at speed did not attract too many flies. It was, however, pushing Fanny’s tolerance and general good humour a little too far and I noticed she was no longer referring to my beloved furry seat pad as “sheepie”, but as “IT”, as in, ‘You’re not bringing “IT” inside, are you?’. Women can be cruel. 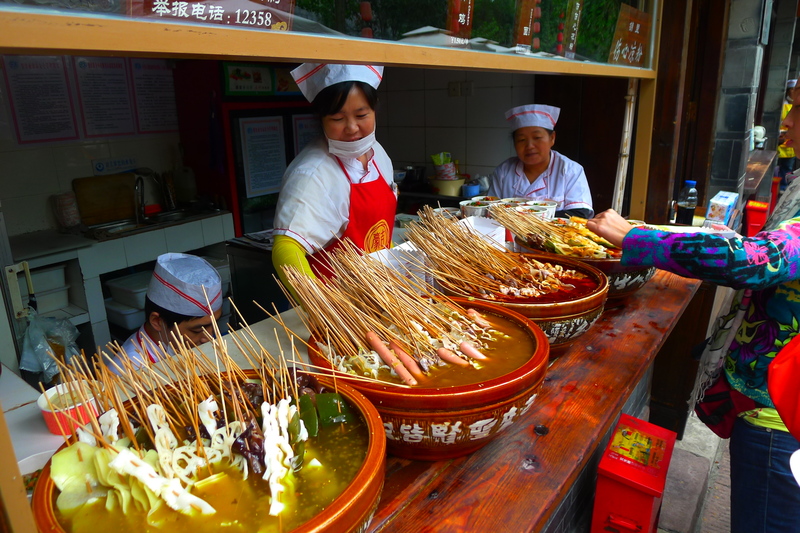 Anyway, we were expected to show an appearance at the China International Motorcycle Exhibition in Chongqing in about a weeks time and so if we made good progress to Chengdu we would have plenty of time to relax and explore one of China’s more prosperous and attractive cities and try out the famous hot and spicy Sichuan food. Takin …. 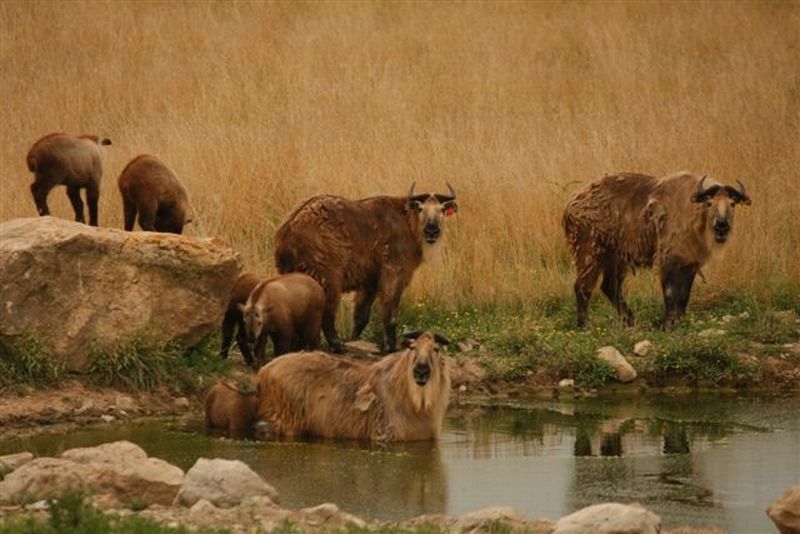 a rare ox/goat muskox creature that is found in the Sichuan mountains… never saw any of these either. 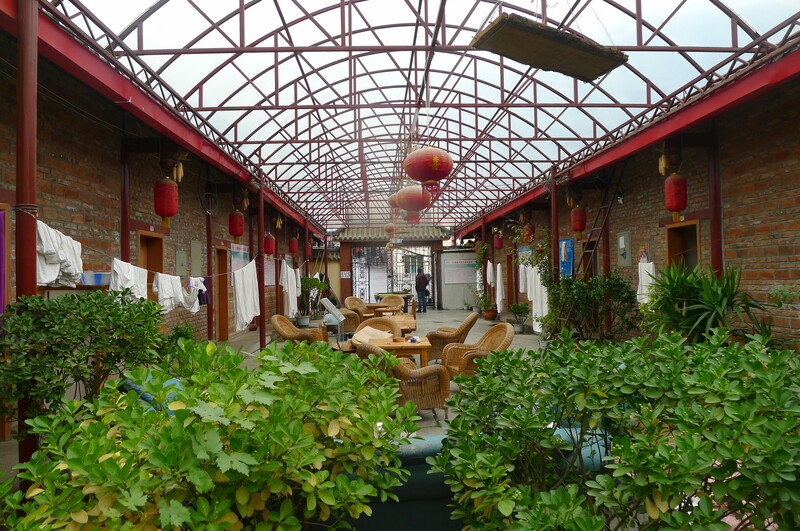 Goodbye to Lang Mu Si .. we’ll be back when you’ve tidied it up. Looks nice from a distance though. 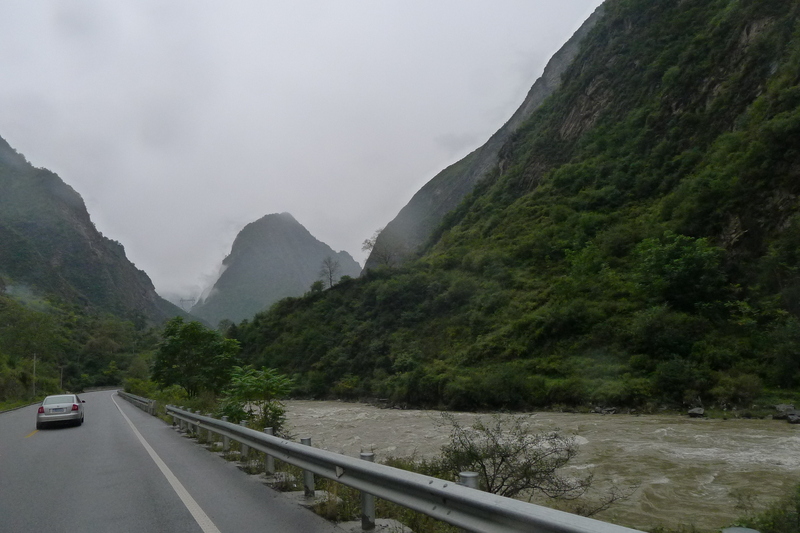 I was not particularly enjoying this bit of the journey, should have done, but the weather was not that great, it was a bit slippy on the roads and the traffic was atrocious. Cars, buses, coaches and trucks often squeezed into us forcing us to brake, skid or swerve. When these vehicles had to stop in traffic we overtook them easily enough, only to have them aggressively re-overtake us as soon as they had a chance as if we had made them lose face. Later our 4 wheeled cousins would all get stuck in a 15 kilometer monster traffic jam and together with all our other 2 wheeled brothers we left them for dust, despite many of the cars deliberately trying to block us. 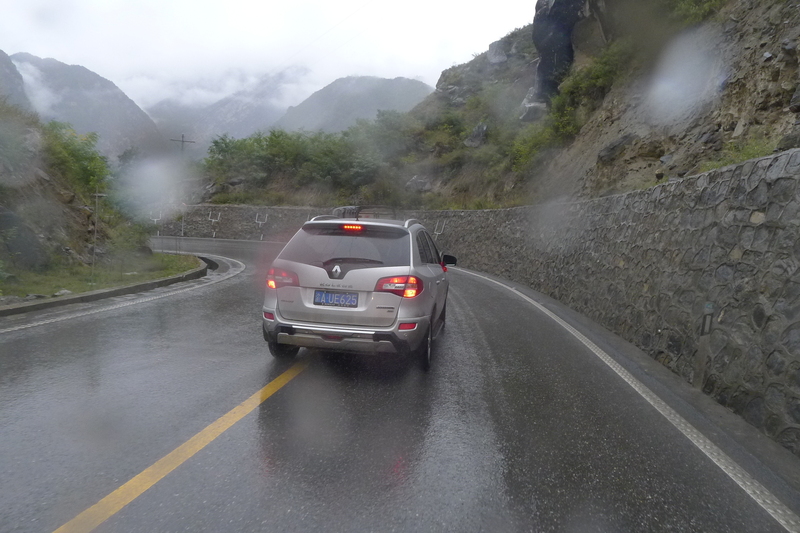 It would be a massive overstretch of the imagination to describe Chinese road users as “courteous”. 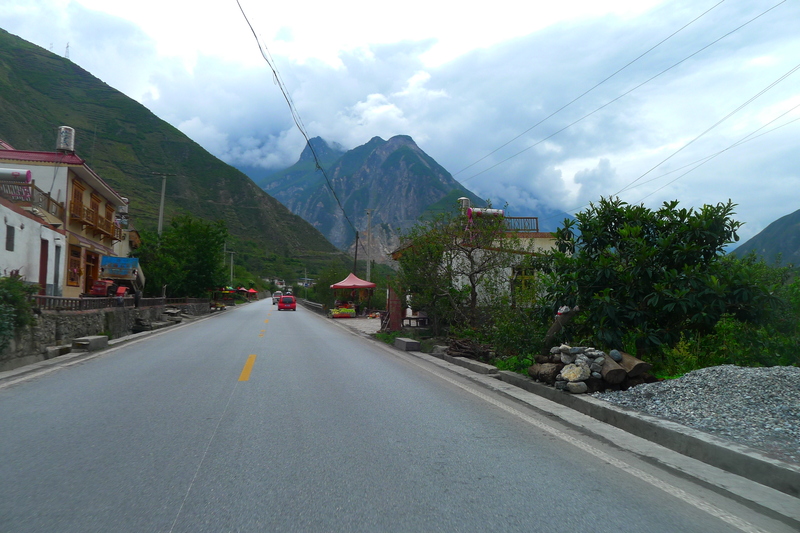 Sichuan…a rare stretch of clear road after taking a road diversion. It is quite a coincidence that both Egyptian and Chinese drivers do not like to turn their lights on, would rather queue in traffic than take a longer more peaceful diversion and are generally inconsiderate and aggressive to other road users. Psychologists have a theory why this is. 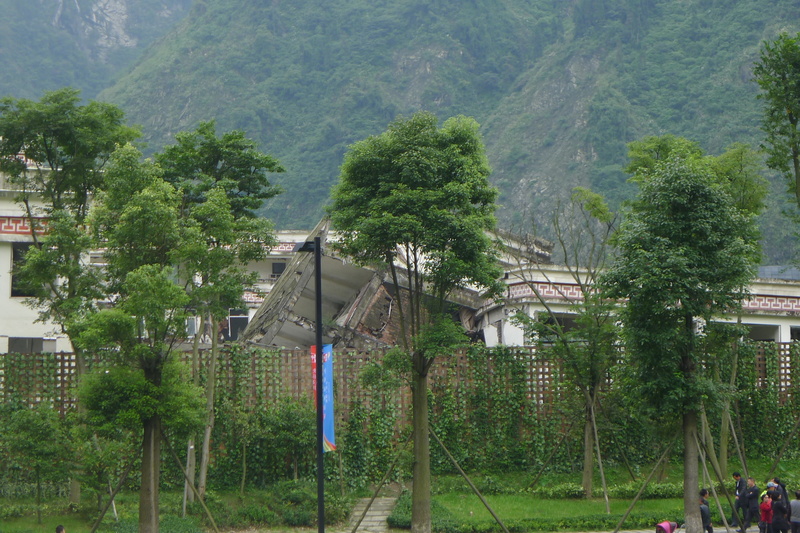 The actual epicenter of the 2008 Sichuan earthquake. 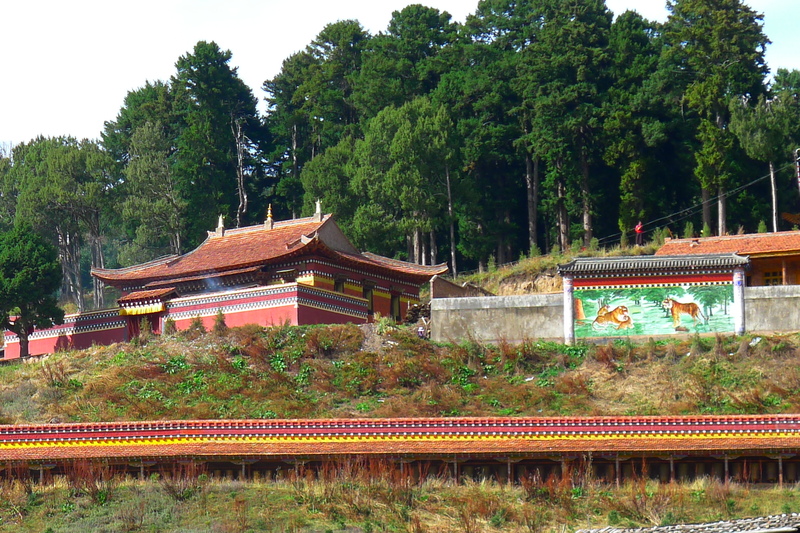 I couldn’t help thinking what would happen if another earthquake struck as we passed by the many steep mountain sides or crossed the many bridges and through the tunnels … not good I guess. India is pushing into China causing the trust fault line at this exact location and so its just a matter of time before there is another earthquake. 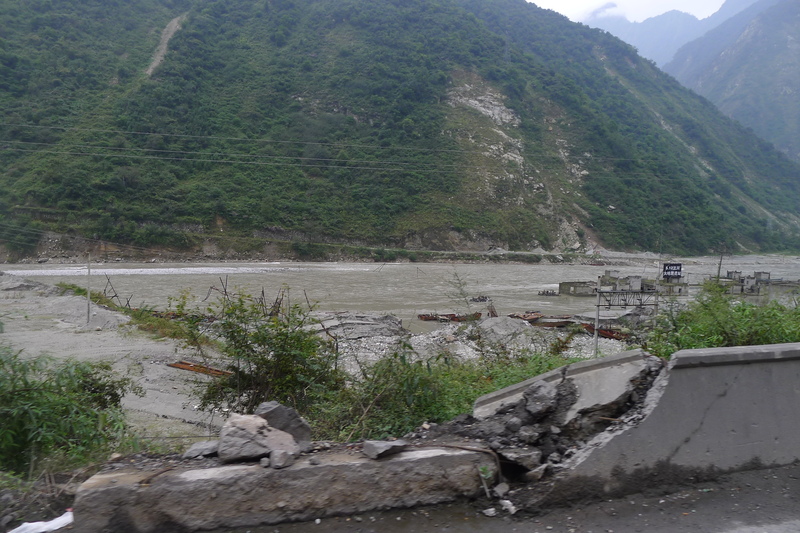 We rode along the trust fault where the Indian plate is pushing into the China one. 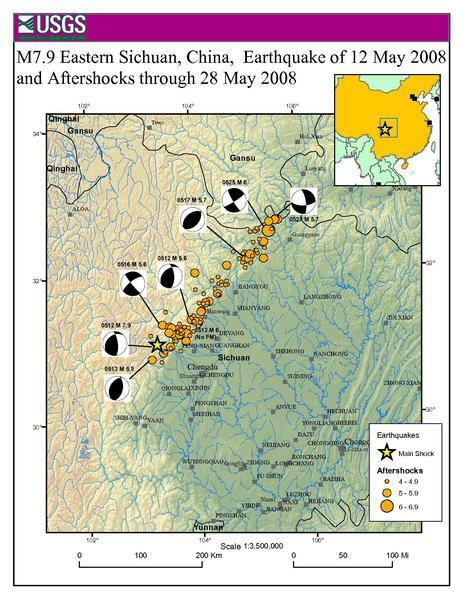 I was actually at the border of Yunnan and Sichuan in 2008 and experienced a strong aftershock of over 6 on Richter scale. The original quake was about 7.9-8.0 and killed hundreds of thousands of people. Superb scenery .. even on a rainy day. 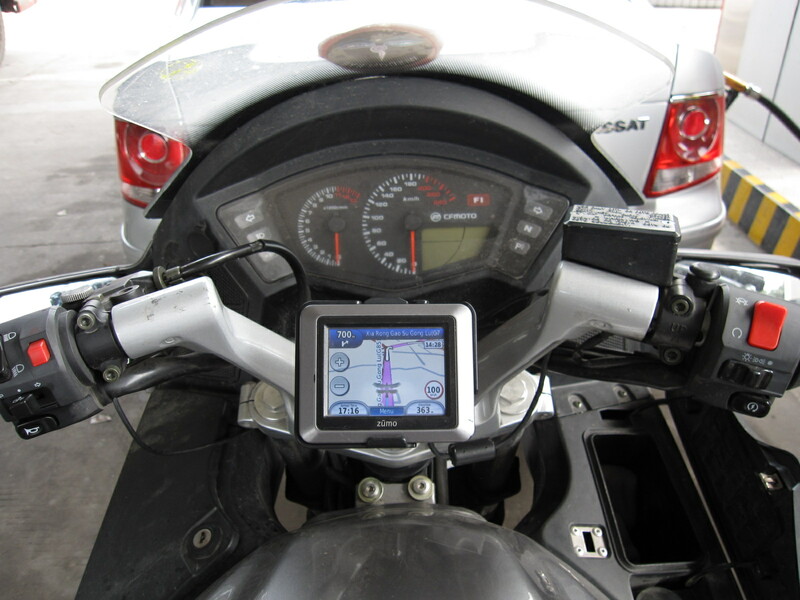 ………………………………………………………………………………………………………………………………The cockpit of my bike had a Garmin Zumo 220 GPS, a Casio multi fuction watch strapped to the handle bars and the excellent CF Moto instrument panel that had everything a rider really needs to know, logically and clearly displayed. 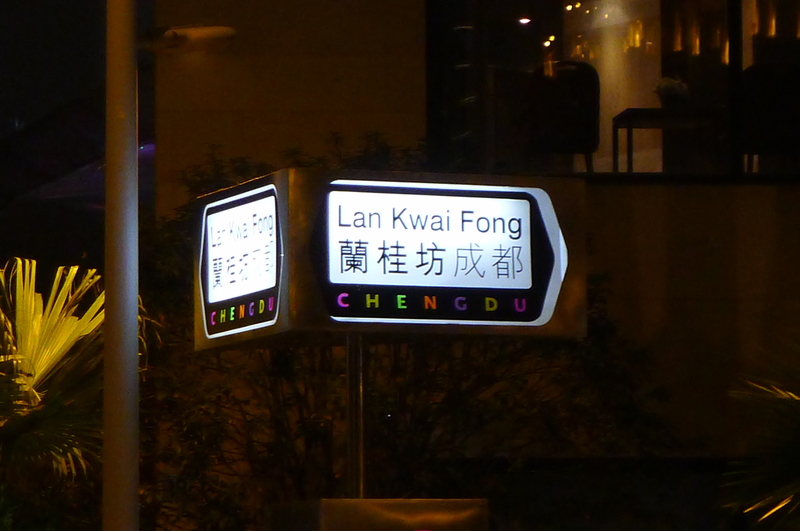 However, navigating in China can be really confusing and I had to make sense of signs that not only used Chinese characters, but were ambiguous and confusing to even mother tongue Chinese speakers. Our GPS maps were not that good either as Fanny had acquired all the maps in the world for “a few kuai” on one of her bargain basement Chinese websites, and so the world map programs for my Garmin were not very good … being neither up to date, accurate or complete. Also, the road construction and development of the towns and cities in China was on a scale unprecedented anywhere else on the planet. 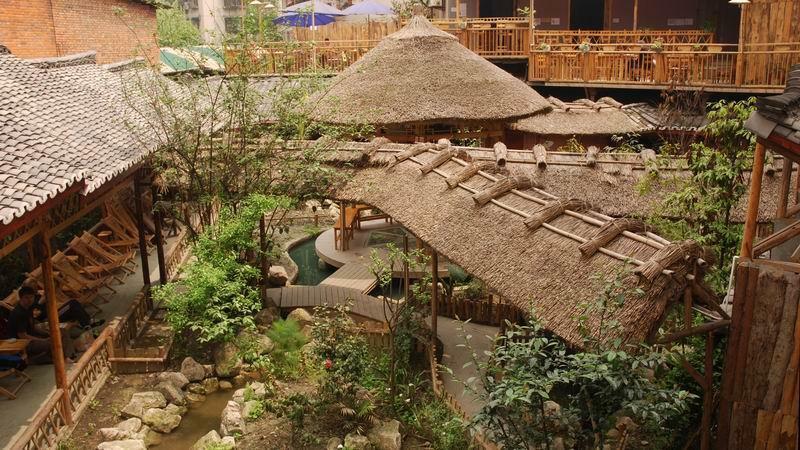 It was constantly changing and being re-built, upgraded or knocked down. We found twelve lane super highways seemingly in the middle of nowhere that did not appear on any of our maps, and occasionally we would follow GPS directions to non-existent roads, non-existent places, and onto the “高速公路” (high speed highways) which we (bikers) were banned from riding on with no obvious alternative route to our target destination. We often arrived at seemingly simple T junctions, as indicated on my GPS, to find enormous spaghetti junction type structures with numerous entrances, exists and slipways. Because of the heavy traffic and appalling driving standards at some of these major intersections there was never enough time to make an accurate assessment of all the available options and we would occasionally get lost. However, more often than not, we would actually end up going the right way. I think over the months we had developed a very acute sense of direction and fined tuned our navigational skills. Christmas presents … who wouldn’t want one? 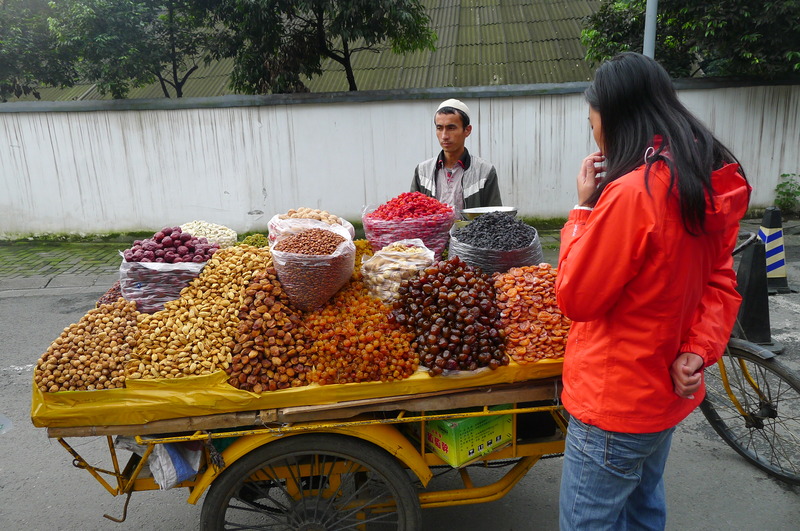 A Xinjiang hawker selling preserved fruits. Profits were going well until Fanny arrived and tried them all before buying two plums..
We stayed in Chengdu for a few days, did some touristy sightseeing and then continued on our way to Chongqing, the largest city in the world with an urban population of over 33 million and where we were to attend the China International Motorcycle Show and meet our sponsors, the media and Fanny’s followers of her magazine articles and blogs. 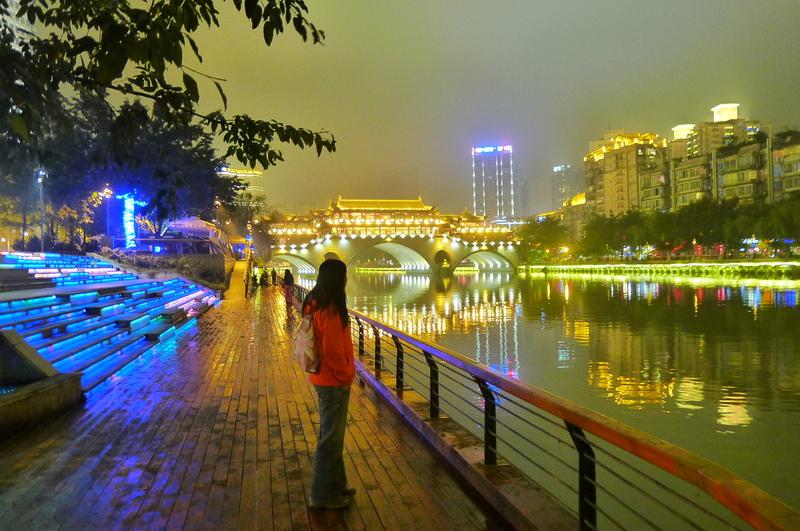 Chongqing is not only a huge polluted concrete jungle, but also home to some of the most notorious and corrupt public and government officials on the planet. If they are not lining their pockets with backhanders they can be found entertaining their mistresses in the ubiquitous KTVs and VIP rooms around the city. If it wasn’t for the fact that these government triads seem to get away with murdering locals and foreigners with impunity, it would be a land of untold opportunity for a forensic investigator like me. 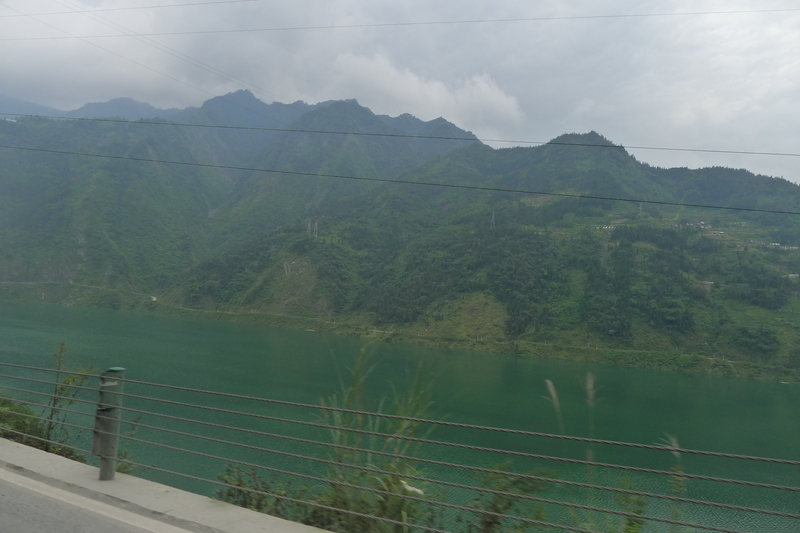 En route to Chongqing… filling petrol direct from the pump. Joy. 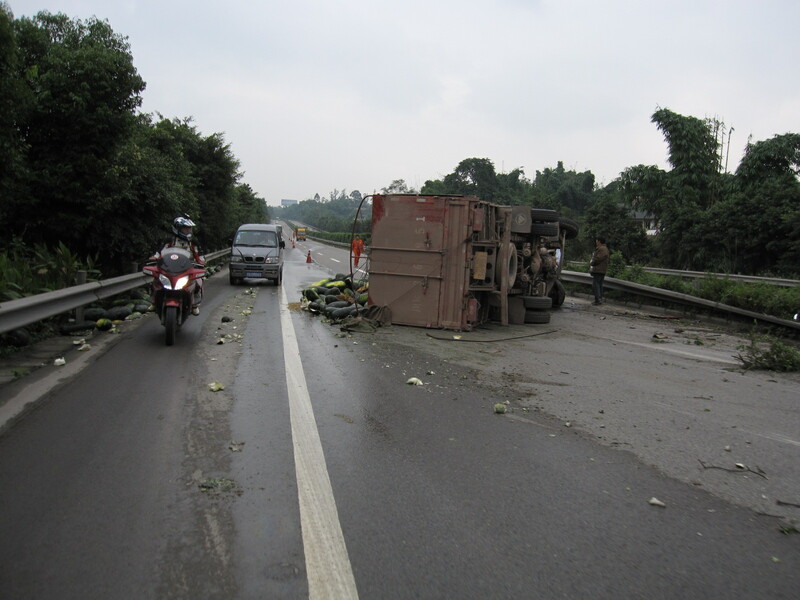 We were riding along highway from Chengdu to Chongqing and saw this “unlucky” truck on its side. 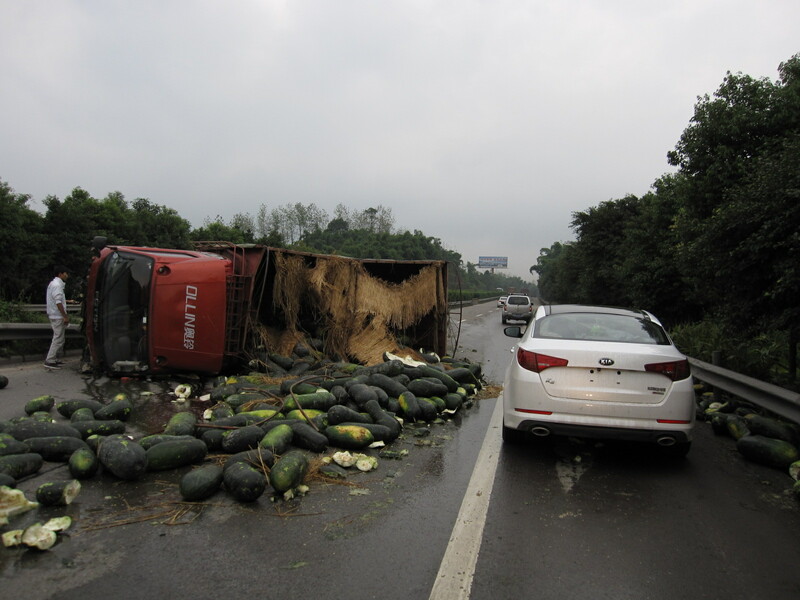 Must have been motoring as it flew over the central reservation from the westbound carriageway and landed on its side spilling melons all over the eastbound carriageway. I know what Fanny is thinking. Not what a terrible accident, but could she snaffle away a melon. 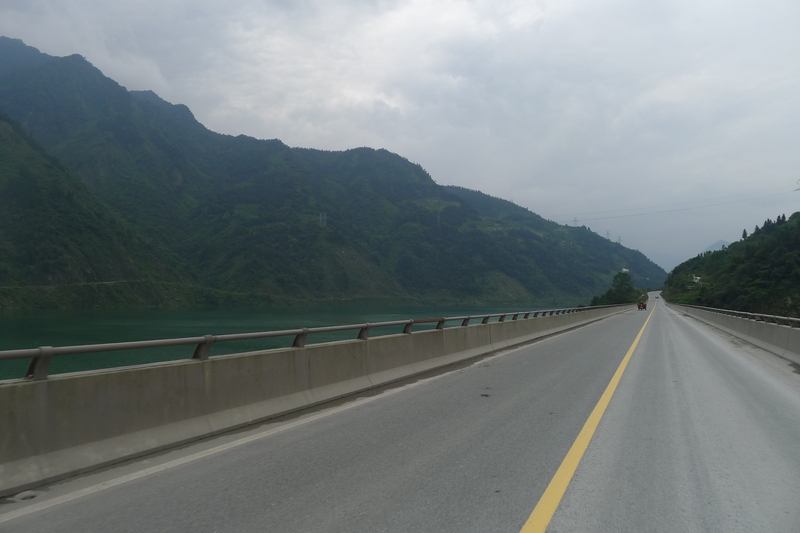 We rode on the Chengdu-Chongqing highway for a while but the police stopped us and threw us off in the middle of nowhere. 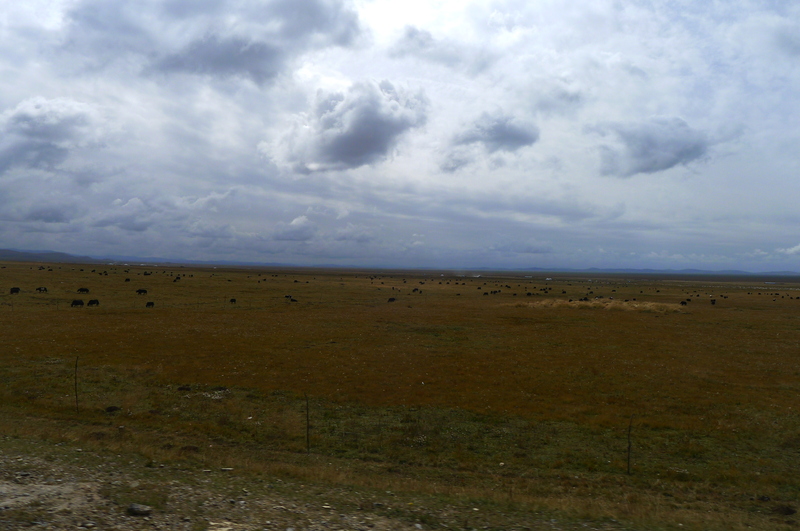 We did not want to spend a day riding the same distance covered on the highway in 2 hours… but that is what happened. 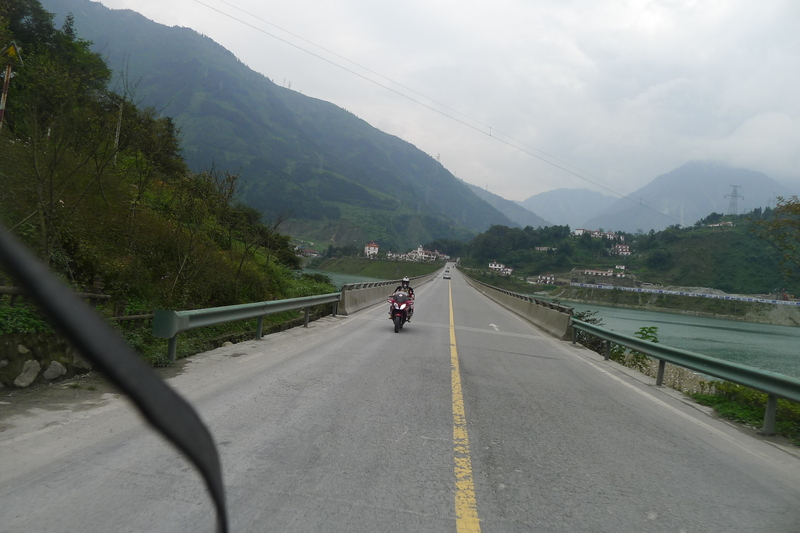 Chongqing and Sichuan are very biker unfriendly places. A few other provinces (we were to find out later) were slightly more tolerant. 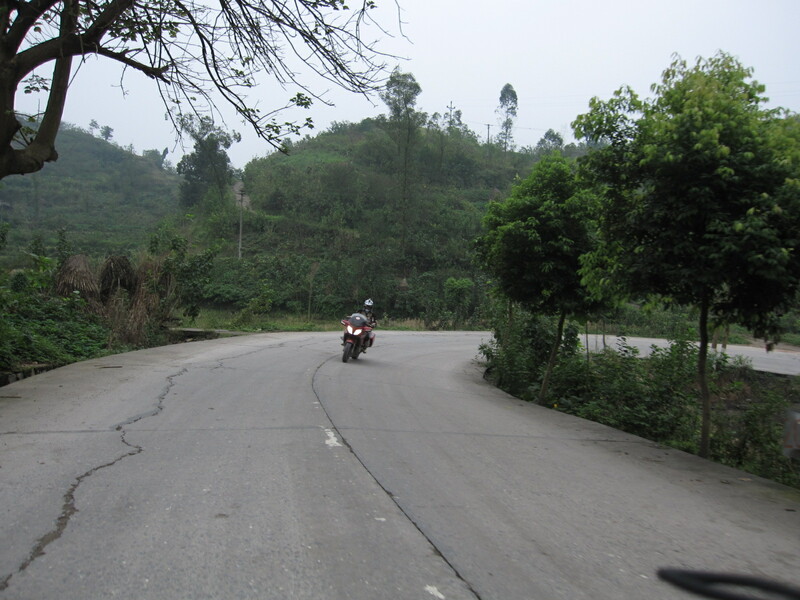 Motorbikes are considered dangerous machines ridden by peasants, and cars are safe and sensible machines driven by civilized people, allegedly. The police escorted us off the next “exit” and gave Fanny a dressing down. 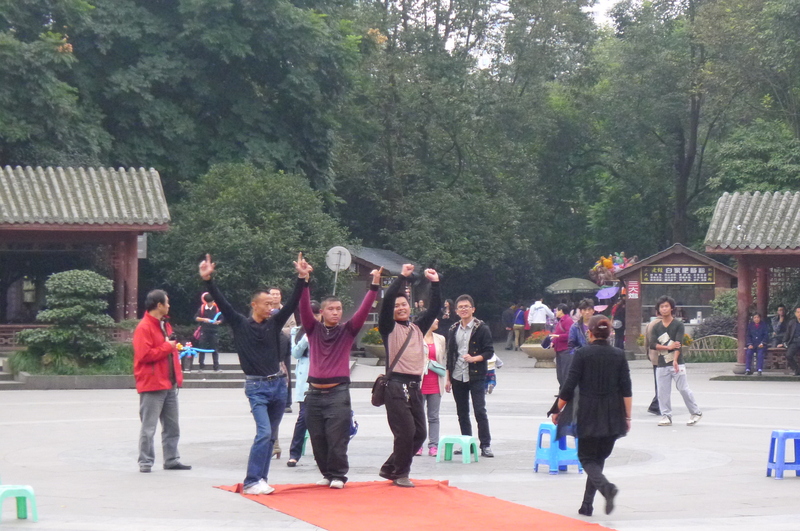 I pretended not to speak or understand Chinese so they left me alone. 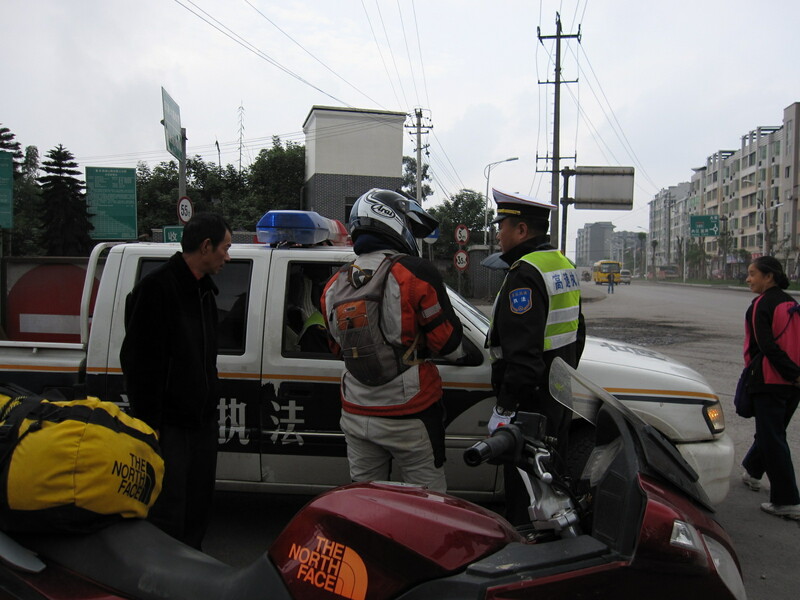 The police in China are very motorcycle unfriendly. I know they are just doing their job, but its a daft and illogical policy. 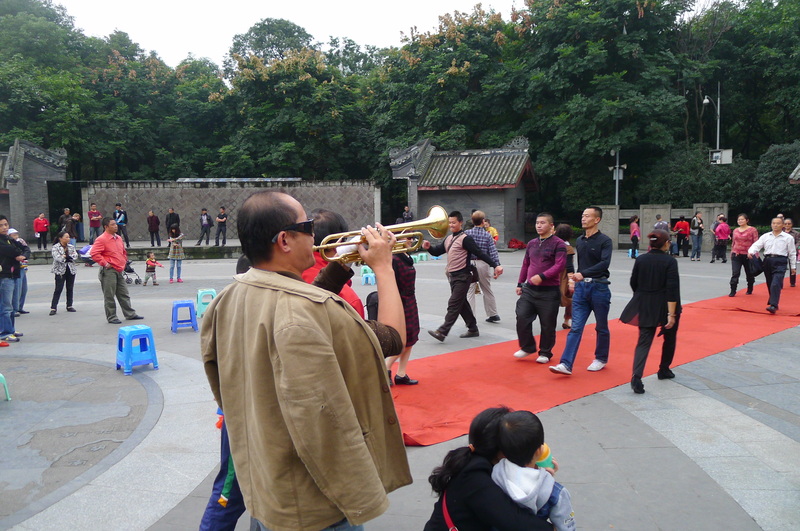 ………………………………………………………………………………………………………………………………..I studied the PRC traffic law and regulations to get my Chinese driving licence and it stipulates very clearly that any vehicle is allowed to drive on a highway and in a particular lane subject to minimum and maximum speed requirements. That is it. Therefore a fully taxed and licensed CF Moto 650 TR touring motorcycle capable of cruising comfortably and safely at 120-140kph should be allowed to ride on any road in China. 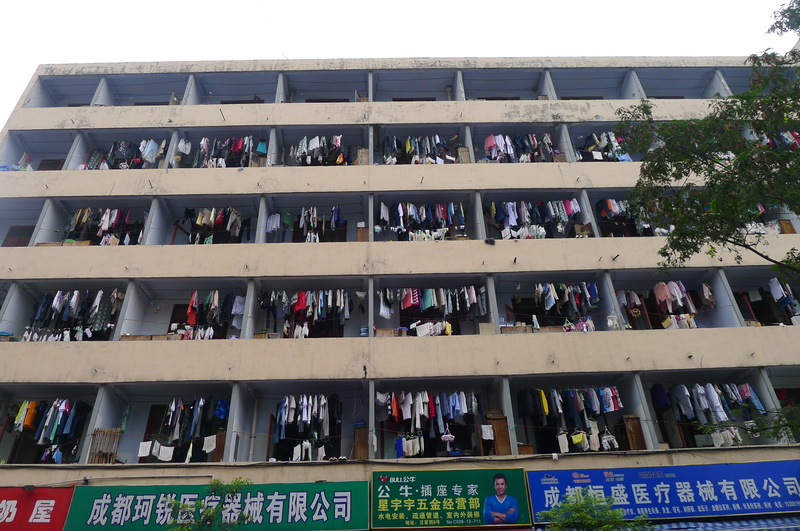 The reality is that in Sichuan, Chongqing and many other provinces of China they are not. 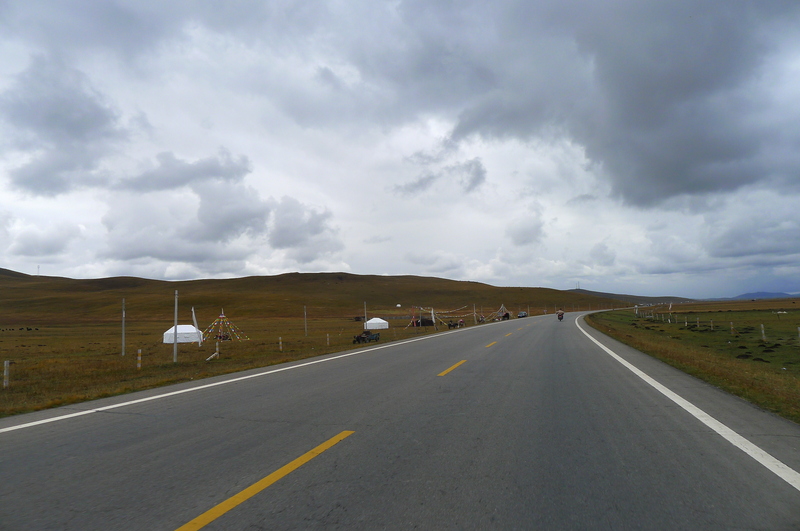 The problem is that it is nearly impossible to get anywhere nowadays in China without going on a highway and so motorcycle touring in China is limited and fraught with risk, danger, restriction and uncertainty. 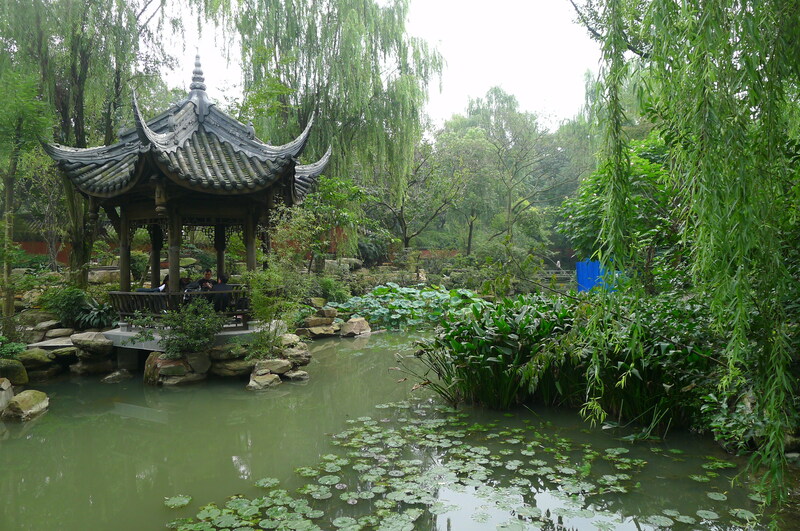 It is a stupid and illogical policy because the rules that apply to the rest of the world could so easily be applied to China. 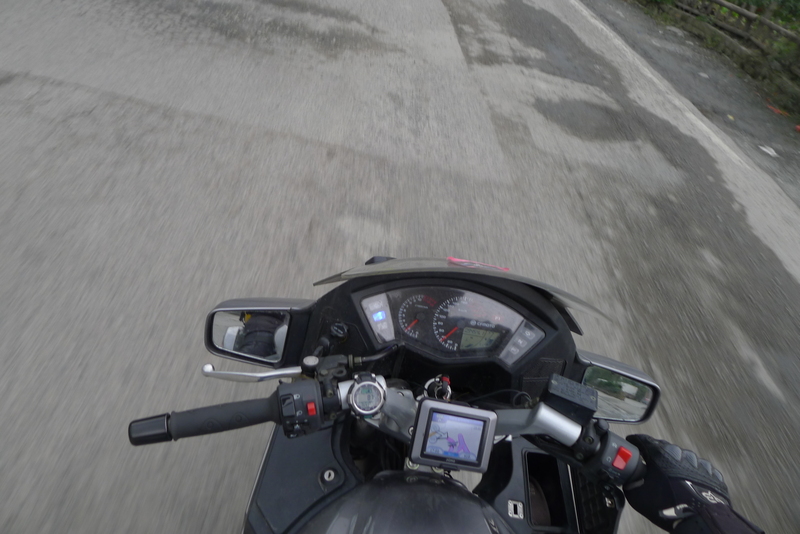 A policy could be made overnight allowing motorcycles above a stipulated cubic capacity (say 250cc) to ride in cities and on highways, follow the Highway Code as all vehicles should, and be required to pay an appropriate toll to use the highway. 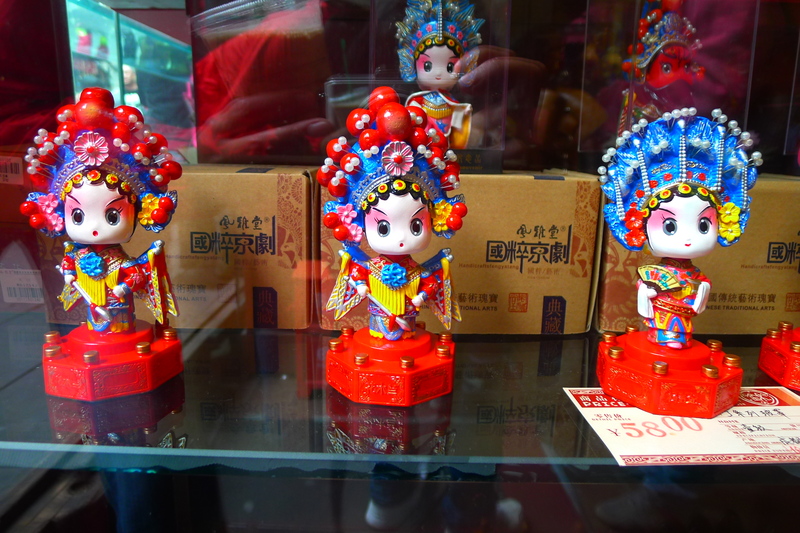 Such a policy would promote the Chinese motorcycle industry and also alleviate the growing traffic congestion in China. Let’s not forget a large Harley Davidson, Ducati or BMW costs upwards of fifty thousand US dollars in China due to high import taxes and vehicles licences and many Chinese firms are now manufacturing good quality motorcycles like our CF Moto 650s and so there is an opportunity for the Chinese to promote an increasingly popular mode of transport and successfully compete against the Japanese and Europeans in this market. 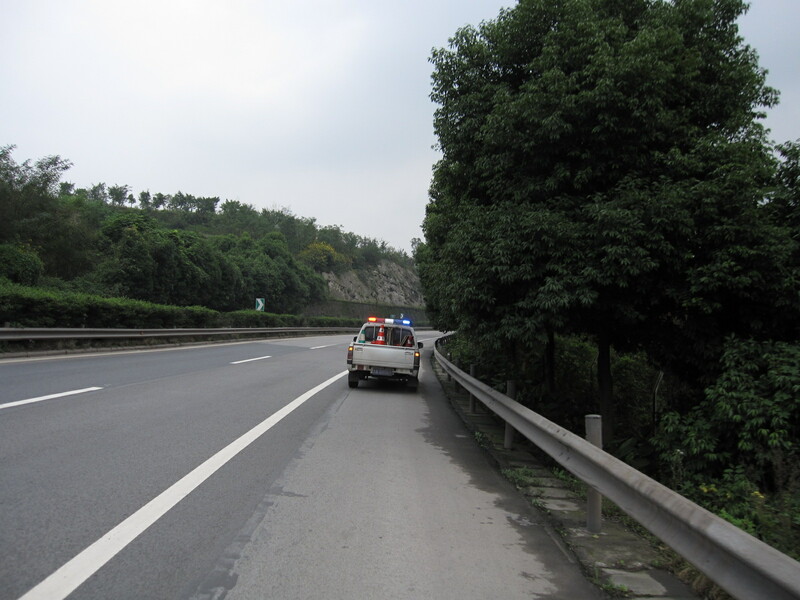 As it was the Sichuan traffic police caught up with us, pulled us over and then escorted us to the nearest exit. 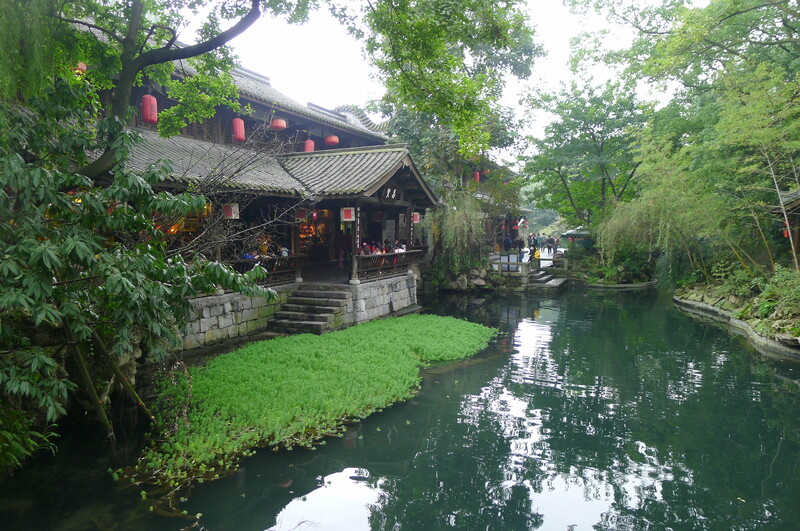 Apart from wasting time checking Fanny’s documents (not mine), they were particularly unhelpful and gave us no alternative routes or suggestions on how to get to Chongqing City. In the end it took us a long day to make the 200 kilometers because many roads in this part of China, other than the highways are left to rot, are badly maintained, are badly sign posted, dangerous and extremely indirect. This is OK if you want to look around, but I for one had had enough of riding through one dusty ugly polluted concrete shithole after another. I was also tired of being on high alert, riding defensively and worrying about Fanny being wiped out by the atrocious and selfish drivers. 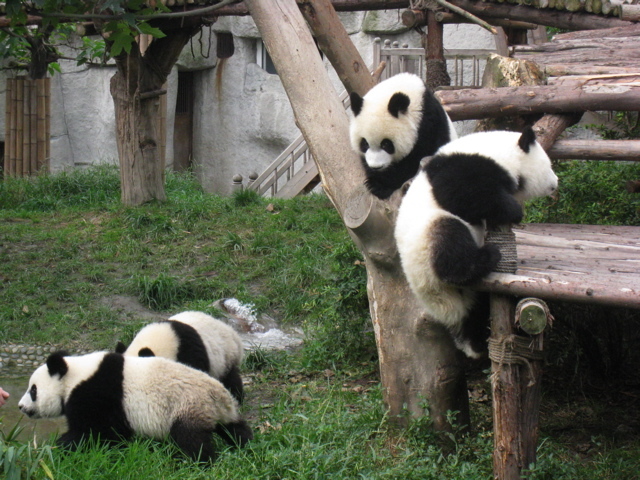 China needs to sorts this nonsense out. It is double standards as there were overloaded trucks, appalling driving standards and badly maintained vehicles on the highway, but alas the police did absolutely nothing about them. 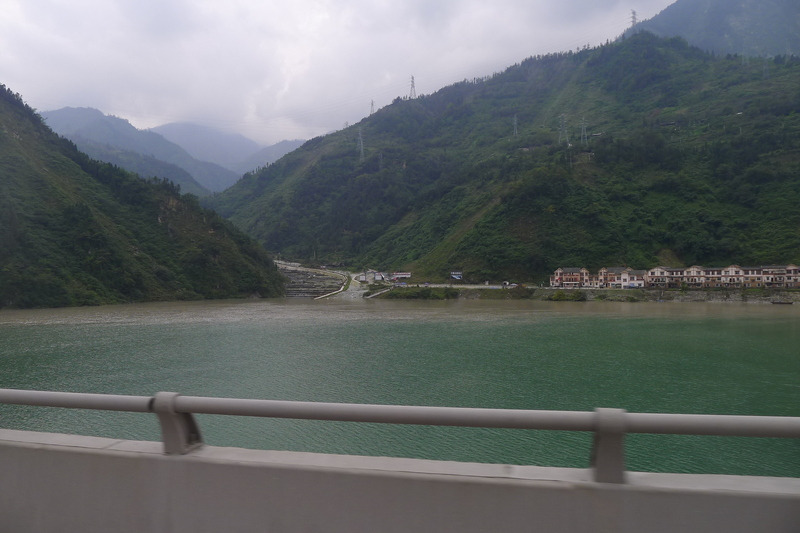 Suffice to say we had a truly awful and stressful ride into Chongqing, and I can’t think of anything vaguely pleasant or memorable to write about on this section of our journey. 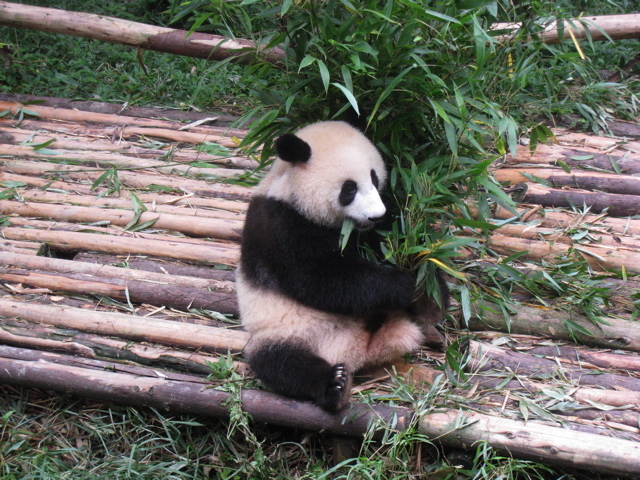 I definitely didn’t see any pandas. Next….. Chongqing Mega-city, The China International Motorcycle Exhibition, the motorcycle and adventure travel media, posing for photos, three dinners a night, muddy roads, an unexpectedly enjoyable and beautiful ride through the countryside Chongqing province, The mighty Yangtze River, a real ghost town, and high drama and tension after the Chongqing police throw a traffic cone at Fanny causing her to come off her bike and get injured. 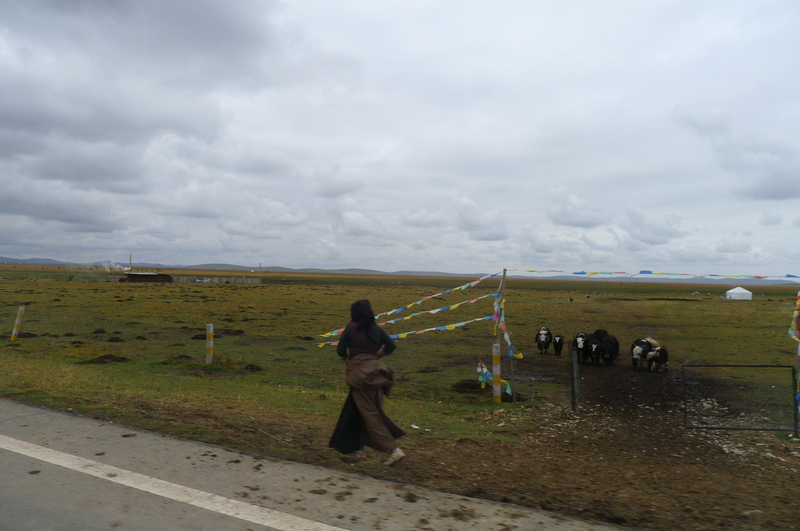 This entry was posted in CF Moto 650TR, China, Fanny, People, Route, Rupert, Tibet, Uncategorized, Visas, Yak. Tagged 650 TR, Africa, Bikes, bridge, CF Moto, Chengdu, earthquake, Fanny, Garmin, KTM, motocycles, pandas, People's Park, Rupert, sichuan, tunnel, 四川， police, 成都， GPS. 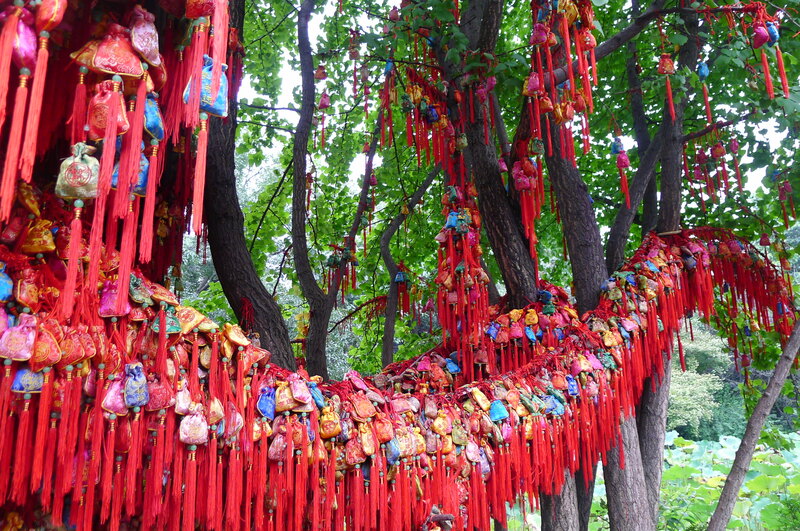 I found this on Lonely Planet blogs, which I have been frequenting recently. This is my kind of blog! 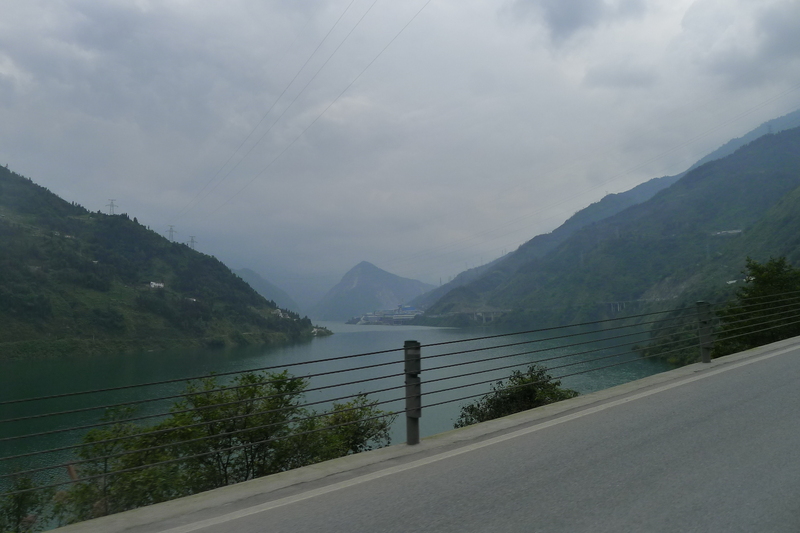 I’ve been secretly becoming increasingly fascinated at the idea of going on a long bike tour. 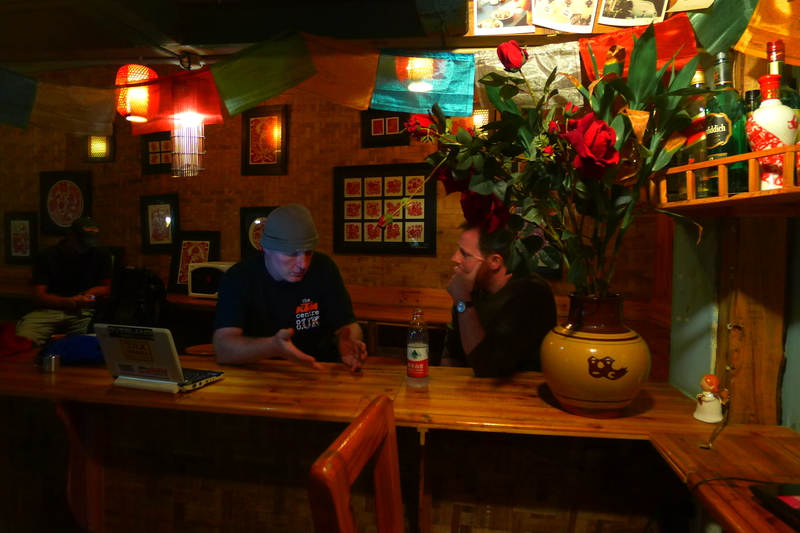 There was a bloke that I had read about in Koh Samui who had done a bit of touring around Africa.